LinkedIn Group discussions — what better way to maximize return on intellect and rev up your social networking? Your interests, affiliations, or work history engage you to join a particular group. You’re with the 10 to 20% whose interests match your own. They, too, are engaged and ready to post, discuss, and share news of mutual interest. In this prime virtual real estate, peers can now become influencers — even promoters. Reality check / news update: In the past week, pitches outweighed postings nearly 2:1 for a particular LinkedIn group. In advertising, that’s noise or clutter. 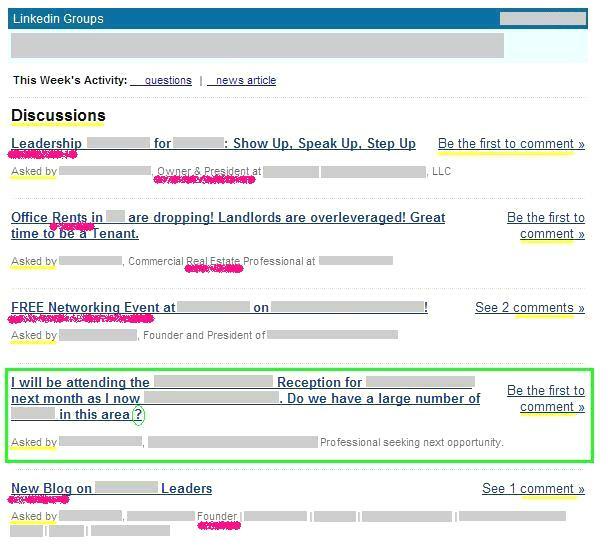 These edited screen shots of an e-mail LinkedIn Group alert help explain it all. All names have been covered to avert guerrilla marketing initiatives — and respect privacy. What does the discussion offer? What value can I bring by responding? Existing response (i.e., comments) helps me decide if I want to click through, read the comments, and add my own suggestions or opinions. Like everyone today, I filter messages in every environment. For discussion boards, that means pitches — strong or weak — and posts that don’t even provide the courtesy of a verb or question mark. Youch, that’s strong! But, see what’s happening? Increasingly, peers are filtering discussion pages just as consumers filter and trash incoming mail, screen calls, and skim text messages. Are you Twitterly inclined? TweetDeck helps you do the same. Content (pink airbrush). Messages fill the context much the way advertising fills a media. Whether you’re networking, marketing, or both, take responsibility for the total message — context, content, and visual rhetoric (persuasive appearance). Effectiveness increases with relevance. Net: sales pitches are ultimately less relevant and effective when plainly posted to a discussion board. Here. Let’s look at five posts in ascending order of effectiveness. A true news item would and could be posted to the news tab. Serving the community by sharing information provides publicity and begins to build brand awareness through goodwill. This “news” item clearly forsakes the reader to bring attention to the poster. If the content reads as an “I” statement, then it’s a sales statement — period. Sales statements are easy to spot. In this case the “topic” and the company name were one. The post reads as a Yellow Pages listing vs. a call to a discussion. A classic sales pitch relies on a hook or door opener to engage community. The same holds true for good discussion. Visual rhetoric also needs to be sharp. As you can see, this “discussion” is weak in its syntax (construction) and semantics (word selection). A pitch is a pitch. A discussion is a conversation. Why does that matter? My brand awareness of the company is weaker from the start. Negative word of mouth (WOM) weakens a brand’s value — your company’s most important asset. The word “New” that kicks off this post offers some hope but ends with not much more — not even an action verb or punctuation to complete the thought. Looking at the “comments” indicates the effectiveness. FYIs can do a service if they provide information or propose value. Here, the poster missed an opportunity to invite the target audience to preview the site and offer feedback, for example. Make your posts social — invite the reader to do something. Solve a problem, offer information, or post an opinion. Making it beneficial to all increases the likelihood of future engagement. That can come in the way of a direct contact or a referral to a peer. You can see that the two posts that emphasize the speaker show no response (comments). The other two posts also pitch but offer some value proposition — whether that’s something “free” or “new.” Interestingly, each of these posts generated comments. The lesson is clear: Discussion empowers all parties. So let’s end on a positive note: Context and content in one. This message begins with a story and ends with a question. If it’s relevant to you, jumping in and answering is natural. Poster #5 builds more brand equity by asking a simple, helpful question. Social media offers a science of common sense. Making a statement creates noise (i.e., clutter). Beginning a conversation (i.e., discussion) creates buzz. So always be sure to begin and end with social. Effective posts enhance discussion (the medium) and empower the people who engage one another.